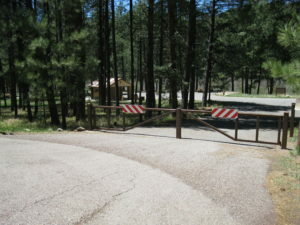 USDA-FS Jemez Ranger District normally tries to open the forest roads for the turkey hunters and dispersed camping by mid-April. Not so this year. Because of a heavy snowpack and mud, most forest roads will remain closed until May 1st. However, as of Friday April 19th, FR 10 is completely open and FR 376 from Gilman Tunnels to Porter Landing is now open. *****Spring Camping Opportunities***** All forest service campgrounds will remain closed until May except Vista Linda Campground which is open year around. Jemez Falls Campground (one loop) and Picnic Area will be open for Easter (April 17-24) and then close until mid-May. Most forest roads will remain closed until May 1st, exceptions being FR 10 and FR 376 from Gilman Tunnels to Porter Landing. Fenton Lake State Park is open year around for seasonal recreational activities. The six electrical spots are open year around…additionally all 30 sites in the lower loops are now open for the season. Amanda’s Jemez Mountain Country Store is open 363 1/2 days a year….closing on Christmas Day and a half day on Thanksgiving. Our summer hours are 8:30 am to 8:00 pm every day. Come on in and say hi. We’d love to see you. 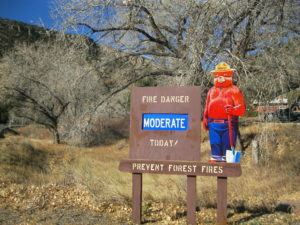 *****CURRENT FIRE DANGER***** MODERATE——————————– As of Monday, April 15, 2019 8:00 am the fire danger within the Santa fe National Forest, Jemez Ranger District, has been rated as MODERATE. There are currently no fire restrictions. 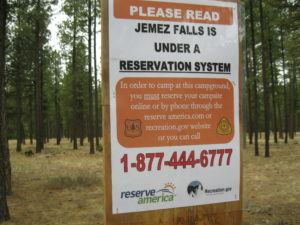 *****CAMPGROUND RESERVATIONS***** You may reserve campground space at both Jemez Falls and San Antonio Campgrounds at the following webpage: https://www.reserveamerica.com/ Forest Service Campgrounds will be open for the season about the middle of May. *****WATER ALERT***** If you are planning to camp the Jemez any time of the year, please fill up your water tanks in your campers and RVs prior to coming to the Jemez. There are limited opportunities here in the Jemez. *****The NEW LICENSE YEAR***** began on April 1, 2019. A new fishing license is required to fish in the State of New Mexico. License fees remain the same. $35 for an adult resident and $11 for a junior (age 12-17) resident. Kids (11 and under) fish free as do adults over the age of 70. There is a senior license for those age 65-69 for $18. All fees above include the required habitat stamps. NMDGF is now offering discounted licenses for New Mexico resident veterans and active duty military. Licenses are available at Amanda’s Jemez Mountain Country Store or you can purchase your license online at http://www.wildlife.state.nm.us/. 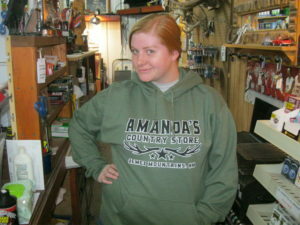 Amanda’s also stocks a full line of bait and tackle. *****ROAD CONDITIONS***** State Hwy 126 from MM26 for eight miles, is closed to through traffic due to muddy conditions. All forest roads remain closed until May 1st. *****CAMPGROUNDS***** Campgrounds are open as follows. Spanish Queen Picnic Area….Open Battleship Rock Picnic Area…Closed La Cueva Picnic Area….Closed Jemez Falls Picnic Area….Open April 17th Spence Hot Spring Access and Parking Area….Open Dark Canyon Fishing Access….Open, Rincon Fishing Access….Open, River’s Bend Fishing Access…Open, Las Casitas Fishing Access…Open, The Bluffs Fishing Access…Open, San Diego Fishing Access…Open, La Junta Fishing Access…Now Open. 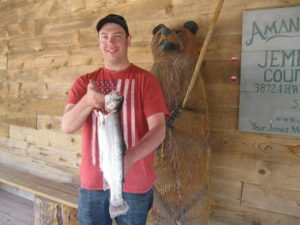 Fishing on the lower Jemez is good throughout the spring and early summer and can be accessed many places other than the Forest Service parking areas. 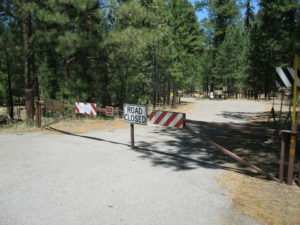 Trails….Forest Service Trailhead Parking areas Las Conchas and East Fork Trail 137….Closed. Trails are open for public use, including trails to Jemez Falls, McCauley Warm Spring, Spence Hot Spring and San Antonio Hot Spring. *****FIRE RESTRICTIONS***** There are currently no fire restrictions within the Santa Fe National Forest, Jemez Ranger District. Fire danger is rated as MODERATE.